Mega•Crafty: More Mom Weekend Knitting and Other Surprises-learning to crochet? 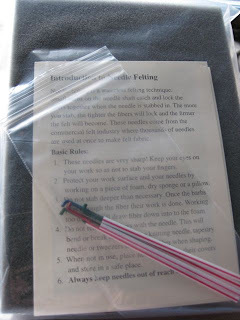 More Mom Weekend Knitting and Other Surprises-learning to crochet? Mom came up yesterday for another weekend knitting lesson/shopping trip/show and tell. She brought with her the latest scarf she knit- and it's gorgeous! 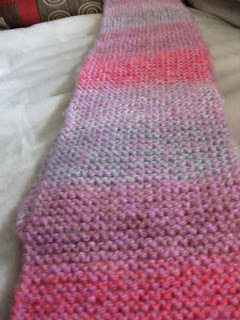 The yarn she used self striped into these beautiful blocks of pinks, greens, and lavenders. We went to Webs while she was up here. I got some needles, this terrific lace weight yarn from Malabrigo. 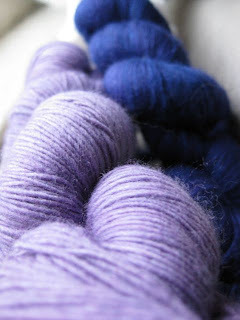 In Cuarzo 97 and Purple Mystery 30 (a lovely dark purple that looks solid until you look close and realize there are indigos in there too). 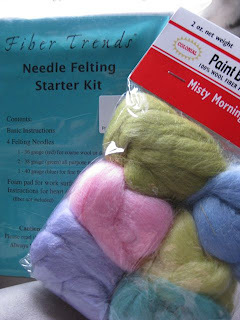 I also got a needle felting kit! I am so excited to try this, can't wait! And shock of all shocks! This weekend- I think I finally managed to crochet something.... quick, someone check to see if the earth is still turning and nature is on it's normal course! I have thus far, never been able to crochet. I was totally in the "crochet is stupid" camp and a card carrying member of the "what the hell is crochet doing in knitting patterns anyway" club. 4 people have tried to teach me, I've looked at books, I've read online, watched videos- and nothing. All I would end up with was a wonky chain stitch and a jumble of knots all piled up in this horrible mess. I have exhausted the ability of some of the finest crocheting friends I have. One memorable lesson ended with my friend (who was "sure she could teach me" because, "I obviously hadn't been shown right" since, "if you can knit you can crochet") saying " I have no idea what you are doing, and I need a beer!" Where she promptly went to my fridge and opened the first bottle she found. 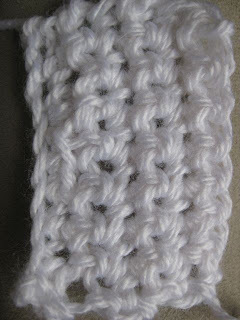 I was up late on Friday night and happened to find a wonderful video tutorial from knitwitch. And I think I've got it! I managed a tiny scrap of something that doesn't resemble the normal jumble of knots I usually get and even seemed to gain length in actual logical rows as I did more. There may be hope yet... thanks knitwitch you must truly have magical powers. One final note on weekend surprises- When I woke up this morning Steve said he had a surprise. I needed to be ready by 10:30 and have casual warm clothes on. I can't imagine what it could be- but it sounds fun. 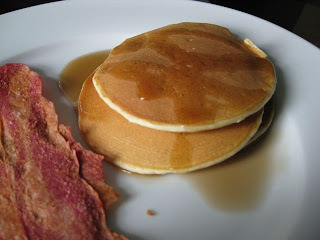 I was just happy that he made pancakes with turkey bacon both mornings this weekend (he really makes the best pancakes ever and somehow gets the turkey bacon crispy just like real bacon, Yummm) I didn't need a surprise too.